Since 2009, Scott Pool has served as Assistant Professor of Bassoon at the University of Texas Arlington. He has also been a faculty member/performer with the Orfeo International Music Festival (Italy), the Schlern International Music Festival (Italy), and from 2002-09 was Associate Professor of Bassoon at Valdosta State University (GA). Recognized as a Moosmann Artist, Scott has performed concerts and recitals throughout North and South America and Europe, and his bassoon performances have been featured on National Public Radio and from local to national television broadcasts. An avid proponent of new music, Scott has played an active role in either direct commissions or consortiums from both established and emerging contemporary composers, including Katherine Hoover, Chris Arrell and Jenni Brandon. 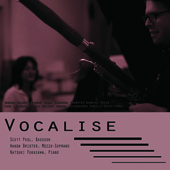 In addition to Vocalise, Scott can also be heard on Landscapes: The Double Reed Music of Daniel Baldwin (2010), also released on Mark Records. Scott has served as principal bassoon with the Valdosta Symphony Orchestra and the Albany (GA) Symphony Orchestra, the Savannah Symphony Orchestra and has performed with the Plano Symphony Orchestra (TX), the Tucson Pops, the Tucson Symphony Orchestra, the Orchestra Symphonica UANL of Monterry, Mexico and the Oklahoma City Philharmonic.